SUNSPOTS come and go, but recently they have mostly gone. For centuries, astronomers have recorded when these dark blemishes on the solar surface emerge, only for them to fade away again after a few days, weeks or months. Thanks to their efforts, we know that sunspot numbers ebb and flow in cycles lasting about 11 years. But for the past two years, the sunspots have mostly been missing. Their absence, the most prolonged for nearly a hundred years, has taken even seasoned sun watchers by surprise. “This is solar behaviour we haven’t seen in living memory,” says David Hathaway, a physicist at NASA’s Marshall Space Flight Center in Huntsville, Alabama. The sun is under scrutiny as never before thanks to an armada of space telescopes. The results they beam back are portraying our nearest star, and its influence on Earth, in a new light. Sunspots and other clues indicate that the sun’s magnetic activity is diminishing, and that the sun may even be shrinking. Together the results hint that something profound is happening inside the sun. The big question is what? Sunspots are windows into the sun’s magnetic soul. They form where giant loops of magnetism, generated deep inside the sun, well up and burst through the surface, leading to a localised drop in temperature which we see as a dark patch. Any changes in sunspot numbers reflect changes inside the sun. “During this transition, the sun is giving us a real glimpse into its interior,” says Hathaway. When sunspot numbers drop at the end of each 11-year cycle, solar storms die down and all becomes much calmer. This “solar minimum” doesn’t last long. Within a year, the spots and storms begin to build towards a new crescendo, the next solar maximum. What’s special about this latest dip is that the sun is having trouble starting the next solar cycle. The sun began to calm down in late 2007, so no one expected many sunspots in 2008. But computer models predicted that when the spots did return, they would do so in force. Hathaway was reported as thinking the next solar cycle would be a “doozy”: more sunspots, more solar storms and more energy blasted into space. Others predicted that it would be the most active solar cycle on record. The trouble was, no one told the sun. The first sign that the prediction was wrong came when 2008 turned out to be even calmer than expected. That year, the sun was spot-free 73 per cent of the time, an extreme dip even for a solar minimum. Only the minimum of 1913 was more pronounced, with 85 per cent of that year clear. As 2009 arrived, solar physicists looked for some action. They didn’t get it. The sun continued to languish until mid-December, when the largest group of sunspots to emerge for several years appeared. Finally, a return to normal? Not really. Even with the solar cycle finally under way again, the number of sunspots has so far been well below expectations. 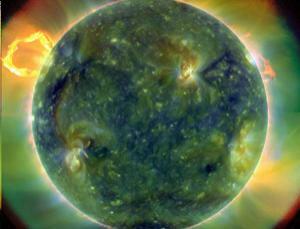 Something appears to have changed inside the sun, something the models did not predict. But what? 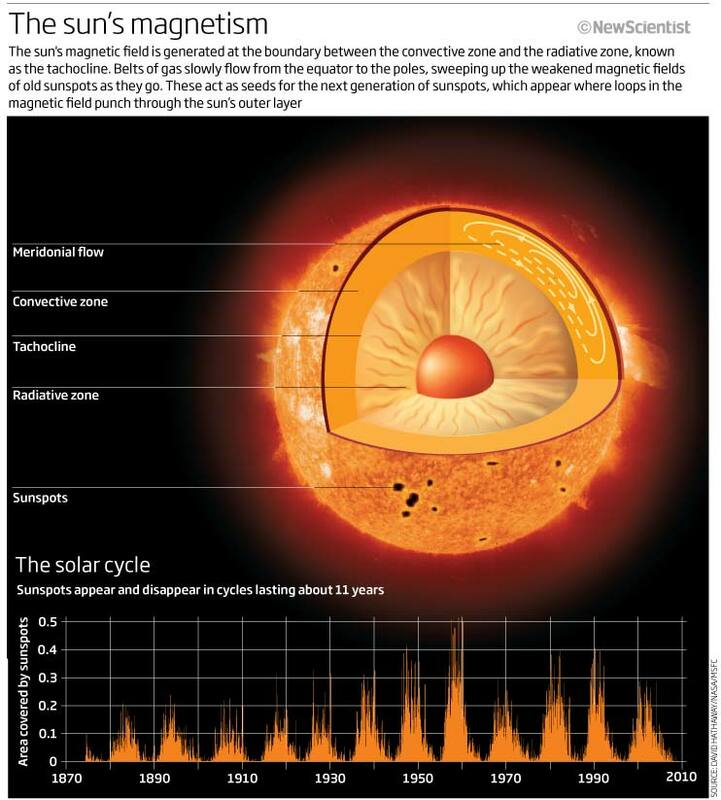 The flood of observations from space and ground-based telescopes suggests that the answer lies in the behaviour of two vast conveyor belts of gas that endlessly cycle material and magnetism through the sun’s interior and out across the surface. On average it takes 40 years for the conveyor belts to complete a circuit (see diagram). When Hathaway’s team looked over the observations to find out where their models had gone wrong, they noticed that the conveyor-belt flows of gas across the sun’s surface have been speeding up since 2004. The circulation deep within the sun tells a different story. Rachel Howe and Frank Hill of the National Solar Observatory in Tucson, Arizona, have used observations of surface disturbances, caused by the solar equivalent of seismic waves, to infer what conditions are like within the sun. Analysing data from 2009, they found that while the surface flows had sped up, the internal ones had slowed to a crawl. It is not just our understanding of the sun that stands to benefit from this work. The extent to which changes in the sun’s activity can affect our climate is of paramount concern. It is also highly controversial. There are those who seek to prove that the solar variability is the major cause of climate change, an idea that would let humans and their greenhouse gases off the hook. Others are equally evangelical in their assertions that the sun plays only a minuscule role in climate change. Mike Lockwood at the University of Reading, UK, may already have identified one response – the unusually frigid European winter of 2009/10. He has studied records covering data stretching back to 1650, and found that severe European winters are much more likely during periods of low solar activity (New Scientist, 17 April, p 6). This fits an emerging picture of solar activity giving rise to a small change in the global climate overall, yet large regional effects. Another example is the Maunder minimum, the period from 1645 to 1715 during which sunspots virtually disappeared and solar activity plummeted. If a similar spell of solar inactivity were to begin now and continue until 2100, it wouldmitigate any temperature rise through global warming by 0.3 °C on average, according to calculations by Georg Feulner and Stefan Rahmstorf of the Potsdam Institute for Climate Impact Research in Germany. However, something amplified the impact of the Maunder minimum on northern Europe, ushering in a period known as the Little Ice Age, when colder than average winters became more prevalent and the average temperature in Europe appeared to drop by between 1 and 2 °C. A corresponding boost appears to be associated with peaks in solar output. In 2008, Judith Lean of the Naval Research Laboratory in Washington DC published a study showing that high solar activity has a disproportionate warming influence on northern Europe (Geophysical Research Letters, vol 35, p L18701). So why does solar activity have these effects? Modellers may already be onto the answer. Since 2003, spaceborne instruments have been measuring the intensity of the sun’s output at various wavelengths and looking for correlations with solar activity. The results point to the sun’s emissions of ultraviolet light. “The ultraviolet is varying much, much, much more than we expected,” says Lockwood. Ultraviolet light is strongly linked to solar activity: solar flares shine brightly in the ultraviolet, and it helps carry the explosive energy of the flares away into space. It could be particularly significant for the Earth’s climate as ultraviolet light is absorbed by the ozone layer in the stratosphere, the region of atmosphere that sits directly above the weather-bearing troposphere. More ultraviolet light reaching the stratosphere means more ozone is formed. And more ozone leads to the stratosphere absorbing more ultraviolet light. So in times of heightened solar activity, the stratosphere heats up and this influences the winds in that layer. “The heat input into the stratosphere is much more variable than we thought,” says Lockwood. Enhanced heating of the stratosphere could be behind the heightened effects felt by Europe of changes in solar activity. Back in 1996, Haigh showed that the temperature of the stratosphere influences the passage of the jet stream, the high-altitude river of air passing from west to east across Europe. Lockwood’s latest study shows that when solar activity is low, the jet stream becomes liable to break up into giant meanders that block warm westerly winds from reaching Europe, allowing Arctic winds from Siberia to dominate Europe’s weather. The lesson for climate research is clear. “There are so many weather stations in Europe that, if we are not careful, these solar effects could influence our global averages,” says Lockwood. In other words, our understanding of global climate change could be skewed by not taking into account solar effects on European weather. Just as one mystery begins to clear, another beckons. Since its launch 15 years ago, the SOHO spacecraft has watched two solar minimums, one complete solar cycle, and parts of two other cycles – the one that ended in 1996 and the one that is just stirring. For all that time its VIRGO instrument has been measuring the total solar irradiance (TSI), the energy emitted by the sun. Its measurements can be stitched together with results from earlier missions to provide a 30-year record of the sun’s energy output. What this shows is that during the latest solar minimum, the sun’s output was 0.015 per cent lower than during the previous lull. It might not sound like much, but it is a hugely significant result. We used to think that the sun’s output was unwavering. That view began to change following the launch in 1980 of NASA’s Solar Maximum Mission. Its observations show that the amount of energy the sun puts out varies by around 0.1 per cent over a period of days or weeks over a solar cycle. Despite this variation, the TSI has dipped to the same level during the three previous solar minima. Not so during this recent elongated minimum. Although the observed drop is small, the fact that it has happened at all is unprecedented. “This is the first time we have measured a long-term trend in the total solar irradiance,” says Claus Fröhlich of the World Radiation Centre in Davos, Switzerland, and lead investigator for the VIRGO instrument. If the sun’s energy output is changing, then its temperature must be fluctuating too. While solar flares can heat up the gas at the surface, changes in the sun’s core would have a more important influence on temperature, though calculations show it can take hundreds of thousands of years for the effects to percolate out to the surface. Whatever the mechanism, the cooler the surface, the less energy there is to “puff up” the sun. The upshot of any dip in the sun’s output is that the sun should also be shrinking. Observations suggest that it is – though we needn’t fear a catastrophe like that depicted in the movie Sunshine just yet. Back in the 17th century French astronomer Jean Picard made his mark by measuring the sun’s diameter. His observations were carried out during the Maunder minimum, and he obtained a result larger than modern measurements. Was this simply because of an error on Picard’s part, or could the sun genuinely have shrunk since then? “There has been a lot of animated discussion, and the problem is not yet solved,” says Gérard Thuillier of the Pierre and Marie Curie University in Paris, France. Observations with ground-based telescopes are not precise enough to resolve the question, due to the distorting effect of Earth’s atmosphere. So the French space agency has designed a mission, aptly named Picard, to return precise measurements of the sun’s diameter and look for changes. Frustratingly the launch, on a Russian Dnepr rocket, is mired in a political disagreement between Russia and neighbouring Kazakhstan. Until the dispute is resolved, the spacecraft must wait. Every day of delay means valuable data being missed as the sun takes steps, however faltering, into the next cycle of activity. “We need to launch now,” says Thuillier. What the sun will do next is beyond our ability to predict. Most astronomers think that the solar cycle will proceed, but at significantly depressed levels of activity similar to those last seen in the 19th century. However, there is also evidence that the sun is inexorably losing its ability to produce sunspots (see “The sunspot forecast”). By 2015, they could be gone altogether, plunging us into a new Maunder minimum – and perhaps a new Little Ice Age. Of course, solar activity is just one natural source of climate variability. Volcanic eruptions are another, spewing gas and dust into the atmosphere. Nevertheless, it remains crucial to understand the precise changeability of the sun, and the way it influences the various regional patterns of weather on Earth. Climate scientists will then be able to correct for these effects, not just in interpreting modern measurements but also when attempting to reconstruct the climate stretching back centuries. It is only by doing so that we can reach an unassailable consensus about the sun’s true level of influence on the Earth and its climate. Although sunspots are making a belated comeback after the protracted solar minimum, the signs are that all is not well. For decades, William Livingston at the National Solar Observatory in Tucson, Arizona, has been measuring the strength of the magnetic fields which puncture the sun’s surface and cause the spots to develop. Last year, he and colleague Matt Penn pointed out that the average strength of sunspot magnetic fields has been sliding dramatically since 1995. If the trend continues, in just five years the field will have slipped below the threshold magnetic field needed for sunspots to form. How likely is this to happen? Mike Lockwood at the University of Reading, UK, has scoured historical data to look for similar periods of solar inactivity, which show up as increases in the occurrence of certain isotopes in ice cores and tree rings. He found 24 such instances in the last few thousand years. On two of those occasions, sunspots all but disappeared for decades. Lockwood puts the chance of this happening now at just 8 per cent. Only on one occasion did the sunspot number bounce back to record levels. In the majority of cases, the sun continued producing spots albeit at significantly depressed levels. It seems that the sunspot bonanza of last century is over. This entry was posted on June 20, 2010 at 2:52 PM	and is filed under Anomalic Interferences. Tagged: anomalies, changes, flares, nasa, solar activity, sun, sunspots. You can follow any responses to this entry through the RSS 2.0 feed. Both comments and pings are currently closed.